Flexite Flexible Partial Dentures, Unbreakable Partial Dentures and Conventional Partial Dentures. With Flexite You Have A Choice! Flexite Plus and Flexite Supreme are nylon thermoplastics ideal for removable partials. Flexite Plus is the most flexible and unbreakable. Flexite Supreme-N is more cast like for precision fits. Flexite Supreme-N is also available in crystal clear formula for beautiful allergy free TMJ, Bruxism and Sleep Apnea Devices. Flexite Supreme-N is also very easy to trim and polish. See our products section for more details. Flexite Ultra is a nylon thermoplastic used for full dentures when a patient is allergic to acrylic. Flexite Ultra is allergy free, unbreakable when used for full dentures and very accurate fitting. Flexite Ultra will reproduce the pallet just like standard acrylic dentures. Flexite Ultra is 100 times stronger than conventional acrylic. Flexite Ultra is not used for partials, it is only recommended for allergy free full dentures. Note: Our new Flexite Supreme-N is also excellent for allergy free full dentures. Flexite Supreme-N has better flexural strength than Ultra and is used for perfect fitting partials as well as full dentures. Both Ultra and Supreme are easy to trim and finish. Ultra is the least flexible Flexite Nylon. Supreme is more flexible than Ultra but less flexible than Flexite Plus. Flexite M.P. is a multipolymer acrylic for full mouth restorations, bruxism, TMJs and anti-snoring devices. Ideal for when a patient is not allergic to acrylic because it is easy to reline in the dentist office. Flexite M.P. is already polymerized so no liquid monomer is added during manufacturing. This makes it kinder to mucosa than conventional acrylics. Allergy prone patients can use our crystal clear Flexite Supreme-N nylon for their bruxism, TMJs and anti-snoring devices instead of our Flexite MP acrylic. All Flexite nylon thermoplastics can be added to with cold cure acrylic or our Flexite super fine Rapid Set Acrylic Powder. Aron Alpha bonding cement is applied first and allowed to dry for 5 minutes before cold curing to Flexite nylon plastics. Aron Alpha bonding cement and Rapid Set Powders are available from Flexite. Rapid Set super fine acrylic powders are available in pink, ethnic and clear colors. Flexite Acetal is available in most Vita and New Hue Shades. Flexite Acetal is formulated to accurately match the Vita shade guide. In addition, Flexite also has three bleach color Vita shades: OM1, OM2, and OM3. Flexite Acetal is used for tooth colored frames and clasps, provisional splints and clip on cosmetic veneers. We also sell bulk Flexite plastic and empty aluminum cartridges. We must be doing something right, as so many others are getting into the act. We welcome competition, but when the dust settles, the Flexite Company will still be way ahead of the flock with 56 years of proven reliability, dependability and innovations. — First to develop patented prefab clasps. — First to develop technique to add and reline flexible partials without re-investing in flasks. — First to introduce tooth colored clasps to the dental industry. — First to introduce adjustable bruxism or TMJ’s with Flexite M.P. — First to offer free Shade Guides for our Flexite Laboratories. NOTE: FLEXITE THERMOPLASTIC SOLD IN CHINA BY SUSAN WANG YANCHENG DILING MEDICAL INSTRUMENTS CO. LTD IS NOT AUTHENTIC GENUINE FLEXITE. ROYAL DENTAL LAB- SCIENCE & TECHNOLOGY INDUSTRIAL PARK, BUJI SHENZHEN, CHINA IS NOT AUTHENTIC GENUINE FLEXITE. BOTH THESE CHINESE COMPANIES ARE SELLING BOOTLEG, IMITATION PLASTICS AS FLEXITE ON ALIBABA WEBSITE AND THEIR WEBSITES. 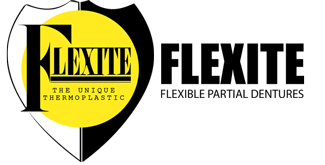 FLEXITE DOES NOT SELL ANY THERMOPLASTICS IN CHINA.